The Veterinary Genetics Laboratory (VGL), in collaboration with Dr. Niels C. Pedersen and staff, has developed a panel of short tandem repeat (STR) markers that will determine genetic diversity across the genome and in the Dog Leukocyte Antigen (DLA) class I and II regions. This test panel will be useful to Black Russian Terrier breeders who wish to track and increase genetic diversity of their breed as a long term goal. Genetic testing of Black Russian Terriers is now in Phase 2 (Preliminary Results and Research) -please see Enrolling a Breed. During this phase, we need to test 200 or more Black Russian Terriers to provide baseline genetic data necessary to provide breeders with an accurate preliminary assessment of genetic diversity in their breed. We encourage breeders to submit samples from active dogs to further build the database. The goal is to test enough dogs so that no new alleles or DLA haplotypes are recognized. Price: $50. Beginning Jan 1, 2016, the regular rate of $100 will apply. Short tandem repeat (STR) loci: A total of 33 STR loci from across the genome were used to gauge genetic diversity within an individual and across the breed. The alleles inherited from each parent are displayed graphically to highlight heterozygosity, andbreed-wide allele frequency is provided. The genetic information used to formulate the enclosed tables and graphs came from DNA samples of 93 BRT. We believe that the dogs currently tested represent most of the genetic diversity that still exists in the breed. This data will be updated as more dogs are tested, so allele and DLA haplotype frequencies may change over time. STR markers are highly polymorphic and have great power to determine genetic differences among individuals and breeds. The test panel contains STRs that are recommended for universal parentage determination for domestic dogs by the International Society of Animal Genetics (ISAG) with additional markers developed by the VGL. The diversity of alleles at each of the genomic STR loci and their frequency in the population were used to calculate the internal relatedness of each dog and for the BRT population as a whole (Fig. 1). Internal relatedness calculated for over 93 BRT ranged from <-0.3 (most outbred) to >0.3 (most inbred). Figure 1. Distribution of IR estimates in 93 Black Russian Terriers based on intra-breed diversity (red line), compared with IR adjusted for diversity lost during breed development (blue line). Diversity lost as a result of breed development was determined by comparing allele frequencies at the same loci between in Black Russian Terriers and randomly breeding village dogs from the Middle East, SE Asia, and the Pacific Islands. In addition to the markers used to estimate relatedness, which reflect genome-wide diversity, a set of STRs associated with specific genes in the DLA region (the canine Major Histocompatibility Complex) was identified and used to measure genetic diversity associated with immune function (see sidebar). We have identified 9 different STR-associated DLA Class I and 7 DLA Class II haplotypes in BRT (Tables 1 and 2). Various Class I and II haplotoypes are also linked to each other forming 9 extended haplotypes. DLA-Class I and Class II STR-based haplotype frequencies in BRT are also provided in the Tables 1 and 2. The STR-based haplotype nomenclature used in this breed diversity analysis is based on numerical ranking with the first haplotypes being identified (in Standard Poodles) being named 1001, 1002, ... for class I haplotypes and 2001, 2002, ... for class II haplotypes. It is not unusual for various dog breeds to share common and even rare haplotypes, depending on common ancestry. Therefore, identical haplotypes in other breeds are assigned the same number. The numerical nomenclature used by VGL for DLA class I and II haplotypes does not correlate with numerical rankings used by others. The goal for BRT breeders should be to produce a greater and greater proportion of puppies with IR scores less than 0, and with time even lower scores. This will be difficult to achieve given limited genetic diversity genome-wide and in the DLA. The small founder population that went into creating the breed is the most likely explanation for this limited genetic diversity. Even though genetic diversity is limited, it is nonetheless important to properly manage the diversity that exists. Maintaining existing diversity will require using different combinations of breeding stock, including even those from inbred lines with high IR values. 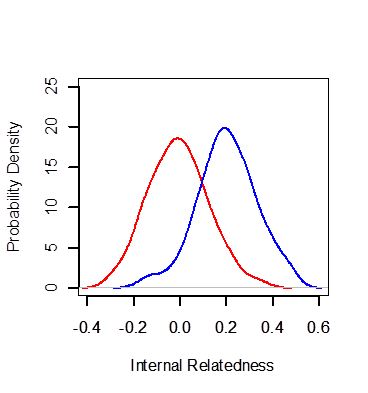 IR values, because they reflect the unique genetics of each individual, cannot be used as the criteria for selecting ideal mates. Mates with identical IR values may produce puppies significantly more or less diverse than their parents. Conversely, a mating between dogs with high IR values, providing they are genetically different, may produce puppies having much lower IR scores than either parent. A mating between a dog with a high IR value and a low IR value, providing the latter has few alleles and DLA haplotypes in common, will produce puppies much more diverse than the highly inbred parent. Breeders should also realize that a litter of puppies may have a wide range of IR values, depending on the comparative contributions of each of the parents. The more genetically diverse and different the parents, the greater the range of IR values in their offspring. An additional goal of this study is to contribute this genetic information to a web repository, hopefully under the control of the registry. This information could be incorporated into a mate selection service that will allow a breeder to identify, among all of the dogs tested, potential mates that would be most ideal for increasing genetic diversity in their litters. The genetics of BRT based on autosomal markers are typical for many of the pure breeds (Table 3). The average number of alleles (Aa) per each of the 33 genome-wide STR markers is 6.27, of which 3.48 alleles effectively define the genetic differences between individuals (Ae). The observed heterozygosity (Ho) and expected heterozygosity (He) are nearly identical, indicating that the population is in near Hardy-Weinberg equilibrium (random breeding). This is reflected by the slightly negative value for F (an inbreeding coefficient). The fact that F is slightly negative but near to zero means that there is a small subpopulation of dogs that are more outbred than dogs in the population as a whole. This genetic information indicates that the breed as a whole has a small genetic base but that breeders are doing a good job of selecting mates that are as unrelated as possible. Black Russian Terriers are known to suffer from several health problems common to larger dogs, including hip dysplasia, elbow dysplasia, and gastric torsion (bloat), which can be considered non-immunologic heritable disorders of ancestral origin and of complex genetic nature. Hypertrophic osteodystrophy, skin and intestinal allergies, and autoimmune diseases such as Addison’s disease are immunologic heritable disorders that are also of a complex genetic nature. Simple recessive genetic traits for which tests are available include hyperuricosuria (uric acid stones), juvenile laryngeal paralysis and polyneuropathy, and progressive retinal atrophy. The presence of both ancestral and more recent complex and simple genetic disorders in BRT is not unique and identical, similar or different disorders occur in many other pure breeds. They are indicators of lost genetic diversity and inadvertent positive selection pressures for desirable traits. This presentation is not long, but will give examples of the Genetic Diversity project used in Standard Poodles, and information that they have obtained from the research done by UC Davis.